Sometimes simple is better. 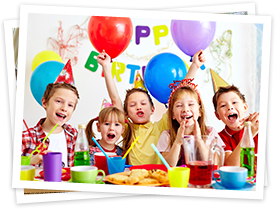 For today’s busy parents we offer one hassle-free party package that allows you to customize your party to fit your budget and child’s desires. We offer complete tailor made private events so you can create the perfect party, exactly how you want it. • Up to 20 children (each additional child is $17). Non-walkers are not counted. • Free Digital Photo Booth for additional fun. $75 value for free. Weekdays Birthday Parties start at just $17 per child (10 children minimum). Call us at 650-642-9444 to leave us a message or email us at info@lapetiteplay.com to find out more. Friday Evening Birthday Parties, 6:15pm to 8pm. The package is the same as the weekend party package. You can add 60 minutes of play time for $150 (Time extension option is only available for the Friday evening parties.) Call us at 650-642-9444 to leave us a message or email us at info@lapetiteplay.com to to reserve your slot. No Birthday celebration in the Lobby area on weekdays. All birthday parties should be pre-arranged with us. There is a $150.00 non-refundable deposit when you schedule a party or event. The balance will be billed at the end of your party. We recommend booking your party or event at least two months in advance. However, we will accept a party reservation 24 hours in advance, subject to availability. Simply visit our website at www.lapetiteplay.com to reserve your party or event now! Cancellation Policy: Your deposit is refundable if you cancel/change your reservation 30 days before your party date, we will only deduct $20 processing fee. Any event cancelled with less than 30 days notice will forfeit their deposit. All set? Book a party and have an awesome adventure!